1920's vintage hoop earrings. Smokey celluloid and amber rhinestones. 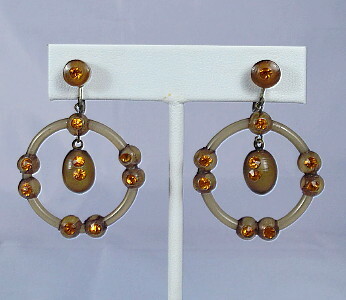 Hoops with ball dots with amber rhinestones at each quarter. Oval ball drop at center. Ball dot with rhinestone button front at screw backs. All original, true 1920's vintage. Excellent. Shows just slight wear.